My novels have been translated into many languages, none of which I can read. I always wonder if meaning gets mangled in the process. I’ll probably never know for sure, but a look at what translating has done to some of my book titles might provide a clue. Here are some of my books with the titles they were given by my foreign publishers. What a hoot! 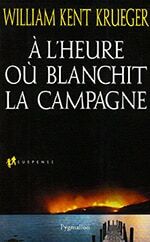 One of the titles that most mystified me at first, and then pleased me immensely is from the French edition of Purgatory Ridge. It’s sold under the title À L’Heure où Blanchit la Campagne. The Google translator gives me this: At the Time When the Countryside Whitens. Suggesting snow, maybe? “But”—my first thought was—“this story takes place in one of the hottest summers on record in northern Minnesota.” Then my really brilliant media maven Sue Trowbridge enlightened me. The title is a quote taken from a rather famous passage by Victor Hugo. I’m quite happy to have one of my own pieces associated, even in a small way, with the work of such a literary giant. If anyone has read any of my books in a translated language, oh would I love to hear from you and get your take on how well the story came through the process. “Windigo Island” is almost here! We’re only a month away from the release of book number fourteen in my New York Times bestselling (I never get tired of saying that) Cork O’Connor series. It’s called Windigo Island, and I’m pretty pleased with it. Stories come from so many places—your own experience, the experiences that others relate to you, news accounts, family histories. Windigo Island came as a request from members of the Native community. They asked if I might write a story that would open the eyes of my readers to a horrific situation that exists in so many areas that have significant indigenous populations. I don’t want to give away any of the plot, but it is, in large measure, drawn from the first-hand knowledge of those who’ve lived the nightmare. Fear is who we are. In every human being, there are two wolves constantly fighting. One is fear, and the other is love. The one that wins the battle? The one you feed. Always the one you feed. 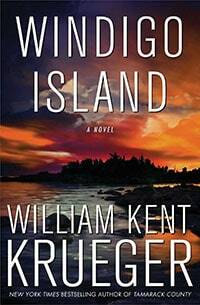 When the body of a teenage girl washes up on the shore of a malevolent place called Windigo Island, the Ojibwe of the local reservation whisper that it was the work of the mythical beast after which the island is named. But Cork’s old friend Henry Meloux believes otherwise and asks Cork to investigate. Because the safety of Meloux’s own family is at stake, Cork agrees. Very soon, he finds himself pursued by monsters both mythic and all too real, and the net of danger quickly widens to include many of those he most dearly loves. What is it that Cork most fears? What is the wolf he battles? Simply this: That he is incapable of saving them. Publisher’s Weekly loved the book and gave it a starred review: Edgar-winner Krueger highlights the vulnerability of Native American youth in his excellent 14th Cork O’Connor novel…and reminds us of the evil of men all too willing to exploit the innocent. Windigo Island is due out on August 19, but you can certainly pre-order using any of the links below. Also, check my tour schedule to find out when I’ll be appearing at a bookstore near you. I’m really excited. I hope you feel a little of that, too.